Thanks to SmartThings, pretty much every room in my house is smart: if the living room is too cold, Nest turns on. When my car arrives home, the garage door opens automatically. When the washing machine finishes, my phone notifies me. Most significantly though, the majority of my lightbulbs are smart. If a smart bulb is connected to a regular wall switch, there’s one big problem: the switch needs to remain on to keep the light powered. If the switch is turned off, the smarts are lost. One solution is to install smart switches but I ran into a significant issue in my 100-year-old home: most of my switches lack a neutral wire. Neutral — or as I like to call it, Switzerland — is one of four connections you’ll find on a smart switch along with ground, load and line. If your house is relatively new, you should be okay but if you have an older house like me, I have some tips for what do when you have no neutral. These tips should also apply to Wink, VeraLite or whatever home automation solution you’ve adopted. Big bold disclaimer: I’m not an electrician and some of these tips will involve ripping out old switches. If you’re unsure what to do, consult a professional. One switch that doesn’t require a neutral wire is the GE dimmer switch. It’s a pretty easy installation process but it has one major drawback: you can’t use LED bulbs with this switch. If you’re using incandescent bulbs though, you’ll be fine. Chances are, you’ll want to use LED bulbs. LEDs will work on regular on/off switches but it will need to remain always on. 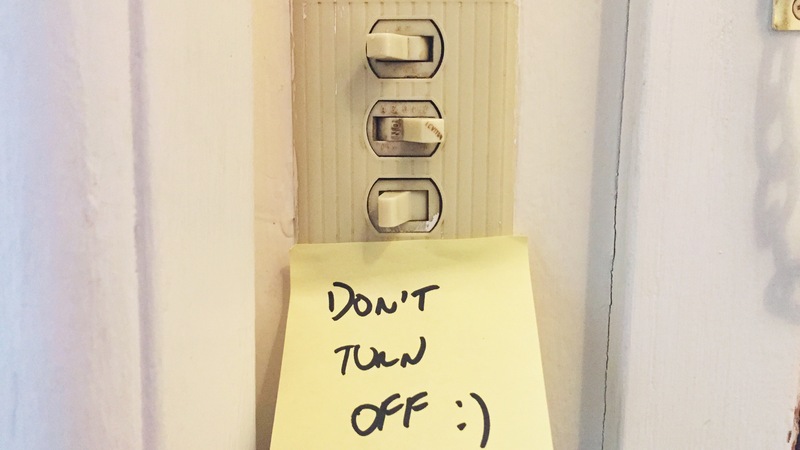 My lo-fi “hack” was to put “Don’t Turn Off :)” Post-Its on switches with smart bulbs. Elegant, non? A more refined solution would be to install switch-guards over the switches. Slightly more sophisticated but those who do not have access to an app are left in the dark (or… in the light). In some areas of my house, I have abandoned switches in favor of motion sensors. For example, when a motion sensor in my basement detects presence, the lights turn on. No switch needed. Or when I enter my bathroom in the middle of the night a light turns on to 10% — just enough to light the way. When motion stops, the light turns off. The solution that has worked best for me is to rip out the switch (see disclaimer!) and nut the load and line together, covering the switch plate with a blank. This means power is always going to the smart bulb. This works well if you add a few motion sensors but does limit interaction to the bulb’s app. For maximum coolness, I replaced a switch with an Android tablet. I purchased a 7″ Digiland tablet from Best Buy for $50 that works well for this purpose. I installed ActiON Dashboard — a SmartThings SmartApp that lets you create customizable dashboards. This gives me easy access to not only the switch I replaced it with, but anything else that I want. I have seen some pretty cool mounting solutions but I opted for something a lot simpler. I added velcro to the tablet and switch plate to mount mine. I placed it nearby an outlet so one disadvantage is that I have a USB cable dangling from it. It’s hokey but it still looks cool. There are a couple of interesting new crowdsourced products that may help those with older houses. Switchmate is an internet connected switch that you place over your existing switch. Installation is simple as it uses magnets. However, it’s currently unknown if it will connect to IFTTT or a SmartThings equivalent. It’s Bluetooth enabled but will require another hub to control when you’re out of range. It’s already achieved it’s 50k goal and will ship in December. Flic can replace a switch but it’s also portable so works in your car or on your person. 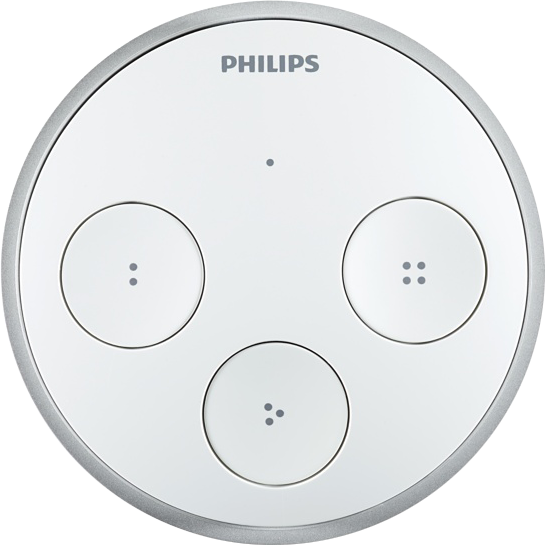 Again, it uses Bluetooth and will connect to IFTTT, SmartThings, and other devices including the Harmony Hub. It’s scheduled to ship in April. Home automation is still a fresh concept and new products are being announced all the time. For the foreseeable future though, we’re going need to find ways to retrofit our old “dumb” homes. Hopefully some of these tips help and once again, I’m not an electrician!